There is so much talk about trends – beauty trends, makeup trends, design trends. Open any magazine and be greeted by tips on how to achieve the newest look. But because trends are, well, trendy, they tend to go out of style quickly. While they’re in, however, we love them – and who wants their home to look outdated? For those of us who must be up-to-the-minute on home décor trends but don’t have the cash to redecorate according to the ever-changing new styles, here are some ways to stay fashionable without going broke. Color blocking has been “in” and “out” many times over the years, and now it is back with a vengeance, appearing on clothing and shoes as well as in hip restaurants and homes. While it is fun to experiment with and looks fresh and modern now, in just a few short years it’ll scream “2013!” – not a fashion statement that you want in your home. 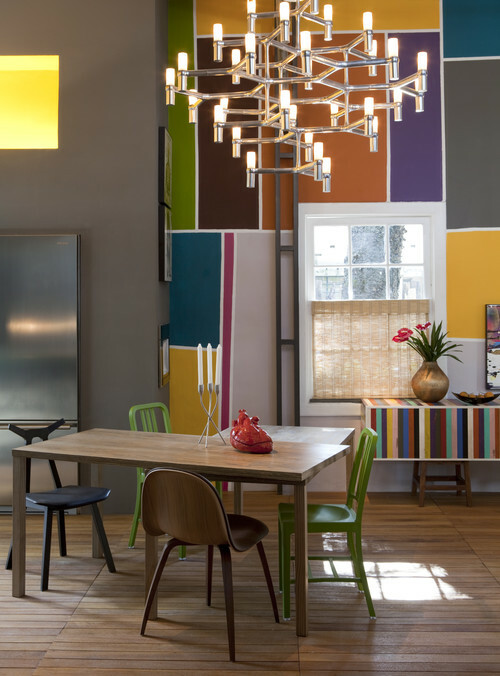 Painting a room in color-blocked patterns, stripes, or geometric shapes can be complicated, jacking up the price of painting. Adding trendy bedding, fabrics, and/or artwork, while easier to remove when the craze dies out, is costly simply due to the fact that these trimmings are currently in vogue. Pick an accent wall – or a portion of a wall – and paint it yourself! 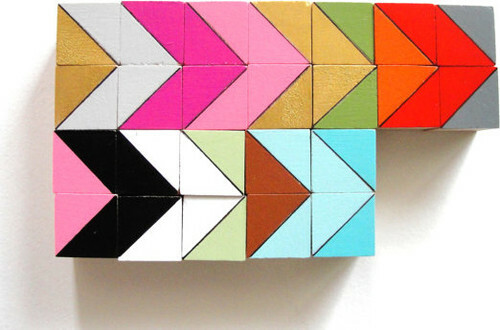 Check out this article on the DIY Network site for great tips on geometric painting – stripes, chevrons, diamonds, and blocks. You can choose to paint a dresser or armoire, picking a different color for each drawer and/or door. If you don’t want the permanence of painted walls or furniture, frame and mount boldly patterned fabric or wallpaper or arrange solid brightly-colored squares or plates on the wall or open shelves. Add inexpensive color-blocked accessories like pillows and lamps – I love the mini color block magnets pictured below from Houzz.com – or even paint a plastic planter for a fresh new look. Evoking thoughts of our furry friends (or ferocious foes), exotic animal prints are cropping up in celebrity homes, on ottomans, on rugs, and even on bedspreads. Real fur looks luxurious but costs a pretty penny. Faux fur, on the other hand, is cheap – and often looks it. Find or make smaller animal-print accessories. Even if you splurge on real fur, a throw pillow, slipcover, or lampshade will cost a lot less than a zebra-upholstered armchair – and will be easier to get rid of once it’s dated. And if you go for fake fur, it is a lot less likely to look tacky in small doses. Because it’s currently fashionable, antique, raw, or distressed furniture can cost an awful lot for beaten-up wood. You can expect to drop hundreds or even thousands of dollars on distressed furniture from retailers. Go authentic! Pick up furniture with real distressing from thrift shops or garage sales, or distress an older piece of furniture yourself using sandpaper, stain, and a chisel. Check out hgtv.com and the DIY network for instructions. For a simpler, less permanent fix, just add distressed cabinet knobs. If you like the natural or raw wood look, sand and shellac tree stumps for a trendy side table or outdoor seat. Every season brings a new “must-have” color (or several of them): emerald! Deep blues! Black and white! Metallics! Like color blocking, furniture and fabrics in the “in” colors tend to be more expensive. Plus, you don’t want to constantly repaint your house with the newest colors! Again, like color blocking, accessorize in the season’s colors. Buy or paint a lamp, put down a new area rug, or plant bright flowers in the newest shades. Find fun, colorful removable wall decals or borders at stores like Target or online at trendywalldesigns.com. If you dare, paint a piece of furniture for a vibrant pop of color – use glossy paint or lacquer for shininess, which is conveniently another current trend! Fashion doesn’t need to cost a fortune! Keep your home décor current while sticking to your budget. You’ll love the way it looks – and the way your wallet feels.